On the 1st of July 2017 at about 7:00 am Dominica lost a true patriot - Nicholas Alexander Nathaniel Ducreay popularly known as NAN Ducreay. He passed away peacefully at his home in Roseau after ailing for several months from kidney complications and problems related to hypertension. Nicholson Alexander Nathaniel Ducreay, affectional known by all as NAN Ducreay was born in the village of Wesley on December 20th 1930 to parents Nicholson Thomas & Enid Matilda Ducreay. He was adopted by his grandparents Victor & Miriam Ducreay at 2 1/2 months of age. His last name was then changed from Thomas to "Ducreay". His paternal father Nicholson Thomas served in Wesley as the head teacher of the Wesley Primary School at the time of his birth and later became the Registrar of Dominica's High Court. NAN Ducreay recalled having a great childhood. In fact, he said "I was an only child, so I was treated like a Prince". His grandparents Victor & Miriam Ducreay owned an estate in the village of Cochrane, so his earliest of memories was on the estate. His grandfather Victor Ducreay, a merchant, entrepreneur and shoe maker in the 1950's owned the most variety shops around the island-16 in total, NAN Ducreay recalled, so he spent most of his early years with his grandmother on the estate in Cochrane. She was a seamstress, wine maker and baker. After his grandfather in his later years fell back on his early trade of shoe making, which he learnt during his teens and perfected while living and working in French Guyana, NAN's Grandfather Victor Ducreay opened and operated the largest shoe making business in the Windwards at the time. NAN recalled people from all over the Windwards placing orders and shipping shoes to clients. The business was called "Ducreay's Sunrise Shoe Making Establishment". NAN Ducreay recalled being sick constantly due to the cold and damp weather conditions on the Estate. So his grandparents made a decision to move him to Roseau when he was about eleven. His grandmother stayed on the estate and his grandfather moved to Roseau with him. They lived in a one room house in Mount Fedelle. That is right after Kairi FM's building now called Constitution Hill. NAN Ducreay completed elementary school in Roseau and then attended the Dominica Grammar School. He had a keen interest in law. From the age of 14 years, while his friends spent time playing in the Windsor Park, he spent his free time at the court house listening to cases. As his family dynamics had changed by the age of graduation from High School, his law pursuits became a priority for the future which was never fulfilled. As a teenager, living in the city, he recalled Roseau being very dark and dull. There were very few vehicles and he had to walk from Cochrane to Roseau. He only got a relief at times from "Millionaire AL Capone", he would say fondly. His favourite place in Roseau to hang out was called Puny on Kennedy Avenue, near the Muslim store location. They sold his favourite boon-jaw and ice-milk for only $2. As a young man, he assisted his grandparents in shipping oranges to Bermuda. As many of the oranges would spoil in shipment, his grandmother came up with a recipe to make bulk wine from oranges to save the harvest. The wine was shipped and sold in Barbados in recycled codfish barrels and became one of Dominica's most popular wines during the World War 11 period. A. C. Shillingford & Co Ltd was the agent and it was called Ducreay's Wine. Teacher Everson Savarin composed a song promoting the wine in 1944 which was very popular on the radio. "Here we are the Grapefruit girls, the only work we do. See how the merry going past, prepares the wine for you. On our pain and dainty squeezer watch us as we extract the juice. Here we are the grapefruit girls . . . If your rich brother has gone from you, don't you forget how we cure you well. Ducreay will revitalize you where-so-ever you may dwell. After graduation from High School, in 1949, he reunited with his paternal mother in Barbados where she resided at the time with the hope of getting a job. Later that same year, he returned to Dominica, thanks to Education Officer Hamilton Maurice having secured a teaching position at the Cochrane Government School. He was a teacher from 1949 to 1952. In 1952, NAN Ducreay started his lumber business with his life savings of $600.00 having saved most of his $65/monthly salary and a small loan from his grandmother. In 1956, NAN Ducreay entered politics. He was inspired by Anthony Joseph, a fellow teacher at Cochrane Government School who had joined the Labour Party led by Phyllis Shand Allfrey, a Caucasian English woman. On the 15th of August 1957, NAN Ducreay became the youngest individual, at that time being 26 years, to be voted as the Parliamentary Representative of the Roseau North Constituency in opposition. In the General Election of 1961, NAN Ducreay won again the Roseau North Constituency seat, under a Labour Party ticket lead by E. 0. Leblanc. He then became the Minister of Trade and Production and served with distinction commitment and dedication. He recalled a few of his greatest achievement during his tenure as a Minister was the establishment of the Dominica Coconut Products Factory-a company that thrived and created great employment opportunities for Dominicans. He ensured that land at Goodwill which originally belonged to the Potters family to be sold to individuals in Goodwill at a low cost, and he supported many Dominicans to migrate to Canada in the hope of a better life. NAN Ducreay served until 1970. In 1975, NAN Ducreay migrated back to Barbados with his wife Theresa and their two sons. In 1978, NAN Ducreay and family returned to Dominica and purchased a building on 90 King George V Street in Roseau from Elias Nassief and lived there until his passing. 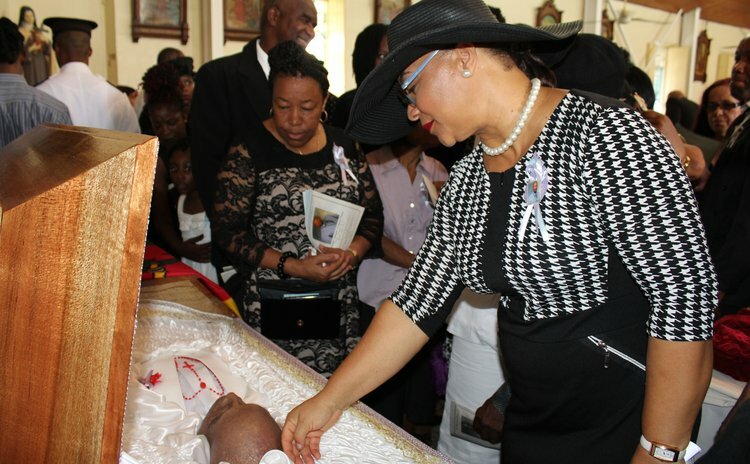 NAN Ducreay loved languages, politics, public service and an intellectual discourse with politics featuring prominently but always focusing on how to make Dominica greater. He was an intellectual albeit without a university degree. He recalled his countless written and verbal contributions in the media and in particular on radio on matters of economic and social development. Politics and public service were in his make-up and DNA but ironically he never wanted or encouraged his children to enter representational politics and none of them did. As NAN Ducreay entered into his twilight years, he became a published writer and produced the book "Great World Stories." His talents were many and writing and public speaking were two of his many talents. He dabbled in song writing and even wrote songs he recalled in family discussions. He was a husband, father of 13 sons and two daughters, brother, grandfather, friend, family man. He was a courteous, polite, honest, God-fearing man who could be found at the confession box every Saturday and every Sunday at Mass. He was someone of integrity who worked for the love of country. His passing represents a passing of an era. It is therefore important to put his death in the context of the era when he and E. 0. Leblanc and others served this beautiful country -Dominica - the era from 1957 to 1970. NAN Ducreay believed that his greatest achievement in life was what he was able to accomplish for humanity-improving the lives of his people. He believed that his greatest disappointment was losing his family estate in Cochrane. He wants to be remembered as an individual who did a lot for humanity as he devoted his life at ensuring the lives of the unfortunate and down trodden was improved. May his soul and the souls of the faithful departed through the mercy of God rest in Peace.